Do you know any amazing people in your community that could use some recognition and appreciation? We all know them, the everyday heroes who quietly go about making the world a better place for all of us. The Awesome Awards are your chance to celebrate these awesome people! Nominations are free and never expire, so nominate as many people as you like! Everyone is eligible as long as they are doing something awesome that inspires you. Awesome Award winners are selected throughout the year and if your nominee is selected, you will have the chance to personally present them with an Awesome Award. If you're inspired by any of the nominations below, be sure to Like, Share and comment on them as it increases their chances of winning an Awesome Award. By pressing Submit, you are creating a public nomination page that serves as a tribute to your awesome nominee. (see below for examples). Nominations never expire, so be sure to let people know about your nomination because Likes, Shares and Comments are considered when selecting Awesome Award winners. 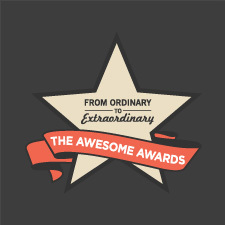 Your nomination is the primary way in which new Awesome Award winners are selected. A good nomination should include a unique or inspiring image of your nominee, their full name and how you know them. It should be written with a spirit of generosity, explaining the reasons why you admire this person and why you think they are awesome. Are they passionate about something you respect? Are they generous with their time? Do they have special skills or talents? What about them inspires you? If there are relevant links, feel free to share them. Your nomination is a tribute to someone awesome. Be sure to share it so that others can also be inspired and join in the celebration of this amazing person!